If you plan on taking the ITIL Foundation exam immediately following class, be sure to include the exam in your purchase. * Include ITIL 4 Foundation Exam? Click the button below to add the ITIL 4 Foundation Course - Accredited to your wish list. Services are the main way that organizations create value for themselves and their customers. Almost all services today are IT-enabled, which means there is tremendous benefit for organizations in creating, expanding and improving their IT service management (ITSM) capability. ITIL provides organizations with a comprehensive framework for ITSM. ITIL 4 brings ITIL up to date by re-shaping much of the established ITSM practices in the wider context of customer experience, value streams, and digital transformation, as well as embracing new ways of working, such as Lean, Agile, and DevOps. This 16-hour course introduces learners to the management of modern IT-enabled services, provides them with an understanding of the common language and key concepts, and shows them how they can improve their work and the work of their organization with ITIL 4 guidance. 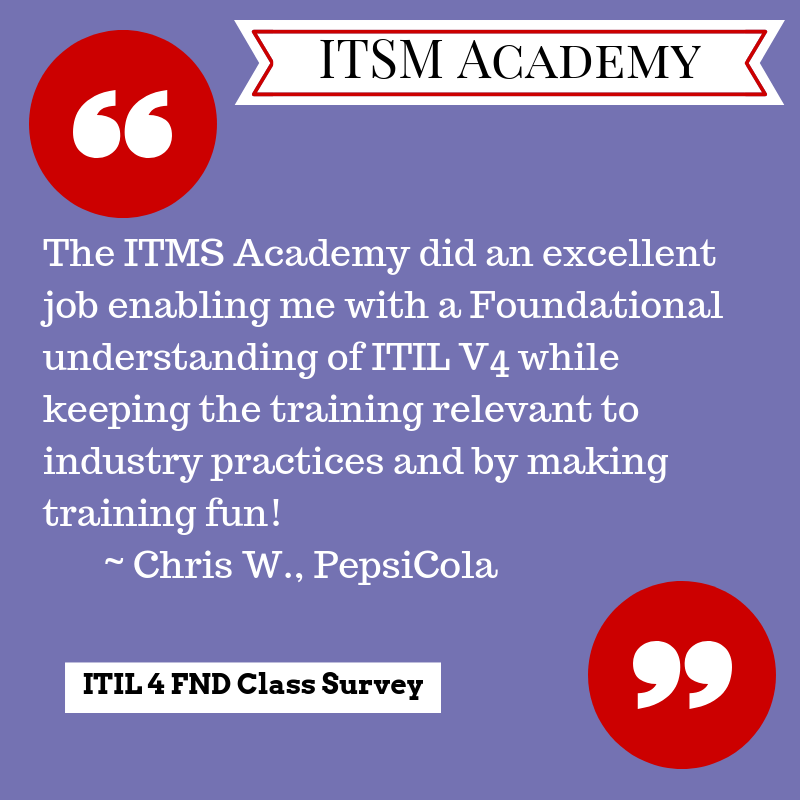 ITSM Academy's ITIL 4 Foundation class includes experiential assignments, GAME ON! 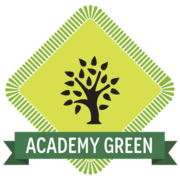 An Interactive Learning Experience® and access to ITSM Academy’s Learner Portal. Also included are memory exercises and study aids, designed to reinforce key vocabulary and concepts and familiarize learners with the exam question style. They include: fill in the blank, matching, and exam prep questions, along with a '"just-for-fun" crossword puzzle. Some are completed as interactive in-class exercises and some are utilized as homework. Developed in-house by the ITSM Academy content team, our course covers all the material specified in the ITIL 4 Foundation Exam Specification and prepares attendees to successfully achieve their ITIL 4 Foundation certification. Come ready to participate in lively discussions about modernizing your organization's approach to IT Service Management. Familiarity with IT and IT services is recommended. Certification: Learners earn their ITIL 4 Foundation certificate in IT Service Management by achieving a passing score (65%) on a 60 minute, 40 question examination. The exam can be purchased along with course seat or at a later date closer to your preferred exam date - use the field above Include ITIL 4 Foundation Exam?. Instructors: As with all ITSM Academy training, our instructors are all ITIL Experts and have years of hands-on IT practitioner experience, enabling them to effectively intertwine theory and real-world stories and scenarios. Utilizing the highest quality content, this training style encourages active group participation. Alumni complete class prepared to pass the exam, but more importantly, with a wealth of practical knowledge. ITIL 4 Webinar - Introduction to ITIL 4. Just finished up my TtT for ITIL 4 with Donna K. Excited with the approach that they have taken to educate learners on ITIL 4. Some great learning to be had for everyone who wants to continue their service management journey. The ITMS Academy did an excellent job enabling me with a Foundational understanding of ITIL V4 while keeping the training relevant to industry practices and by making training fun! This class provided a broad understanding of the ITIL 4 framework and how to begin to incorporate it's concepts into your daily support of the business as an IT professional. ITIL 4 has incorporated the "new ways" of working (like DevOps, Agile, etc.) and provided a clear framework focused on customer value, speed to deliver, and proper governance. The course was well organized and just the right length to keep you tuned in and not overwhelmed. Just went through the new ITIL 4 Foundations course. Very exciting to see how ITIL continues to improve and stay relevant. The course itself was very informative, well laid out and appropriately paced. Well Done. Very good utilization and integration of ITIL v2 and v3 concepts along with the necessary flexibility needed to meet business needs.